Dealing with incontinence on a daily basis is a hassle. Choosing the most comfortable way to handle your incontinence can become a daunting task, but doesn't have to be. If a belted undergarment is your go-to choice for incontinence support, there are still several available options to choose from when it comes to purchasing what's right for you. It's just as important to choose a belt style as it is to choose an absorption rating. Once all of your choices are made, you're certain to get the right fitted undergarment every time. Regardless of the belted undergarment chosen, this type of protection has straps that can either be buttoned or hook-looped. Button-closed:These types make it easier for the user to enclose and protect themselves from any incontinence issues by quickly and easily fastening the garment using this secure method. These undergarments are typically accompanied by reusable straps that fasten around the sides and secure with a button fastened on the front-side of the undergarment. Hook-and-Loop: Hook-and-Loop style incontinence underwear is exactly as it sounds. With a similar look to the button-style, the Hook-and-Loop works like a fastener would with dress slacks, by looping underneath a hook available either in front or underneath the garment. 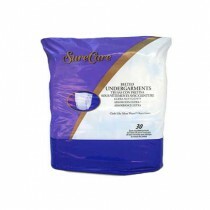 Belted undergarments are a comfortable and discreet choice for incontinence control. Choosing a belted pad is easy: Simply choose the style, the absorption level and the type of belt. Belted undergarments have straps that can be refastened and use either button or hook loop closures. When choosing a product, make sure that you choose an undergarment with adjustable or elastic straps, which will ensure a comfortable fit all day long. If you're concerned about the noise that they might make, choose an undergarment that is constructed with a rustle-free, cloth-like outer layer. If you have a high level of daily leakage, belted pads with a multi-layered core or with super-absorbent polymers would work great. 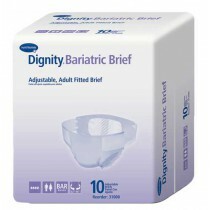 While many are available in a one-size-fits-all, they are also available to purchase in smaller or bariatric sizes as needed. It is important that you choose a product that accurately fits your waist size. 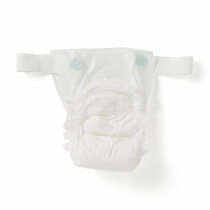 Choosing the correct waist size will help protect against unwanted leaks, rustling noises and uncomfortable bunching. Absorption: The absorption capability of all belted pads is contingent upon the amount and concentration of water-absorbing polymer contained inside the underpad. 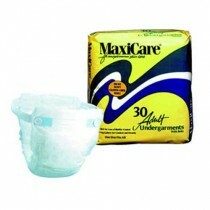 The higher the level and concentration of polymer, the more absorption capacity the undergarment will have. Although it might seem as though larger undergarments contain more absorbing polymer, the amount of water the undergarment can absorb is based on its polymer absorption capability and not just the undergarment's size. When deciding which belted pad to choose, take into consideration a couple of factors. The absorption volume and flow rate of fluid landing on the pad are both things that will affect how well your they works for you. If you experience full or complete bladder loss, then a Super Absorbency pad might be the ideal choice for you, whereas if you are diapered and/or changed regularly, a Moderate Absorbency pad will probably be the right choice for you. If you're currently using a Moderate Absorbency pad and have found that it does not have a high enough absorbency for you, consider switching to a Super Absorbency pad. Don't double up your Moderate Absorbency pad; this will only cause excess bulkiness and an uncomfortable user experience. 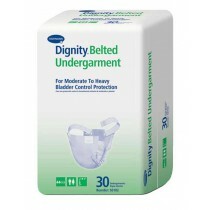 Belt Style: Belted undergarments act as a bridge between incontinence pads and adult diapers. 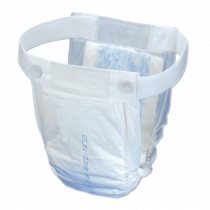 Although the structure can vary by manufacturer, most belted pads consist of a soft, elastic band that sits on the user's hips and a disposable absorbent pad that attaches in both the front and the back. Using this type of undergarment, you do not have to undress to change them out. Simply, undo the belt and swap them out while keeping on your pants or shorts. 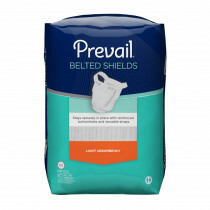 These types of undergarments offer a higher level of protection than incontinence pads but are not quite as bulky as adult diapers. 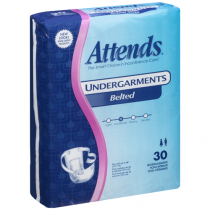 Additionally, these incontinence products for men and women are equipped with side-gripping straps that are easily adjustable while providing additional support.